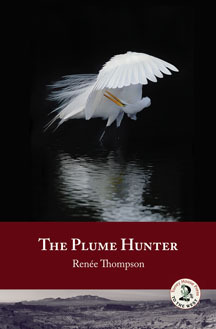 The Plume Hunter follows the life of Fin McFaddin, a late-nineteenth century Oregon outdoorsman who takes to plume hunting – killing birds to collect feathers for women’s hats – to support his widowed mother. In 1885, more than five million birds were killed in the United States for the millinery industry, prompting the formation of the Audubon Society. Renée Thompson writes about wildlife, her love of birds, and the people who inhabit the American West. Her first novel, The Bridge at Valentine, received high praise from Pulitzer Prize-winner Larry McMurtry, author of Lonesome Dove. Renée lives in Northern California with her husband, Steve, and is at work on a short story collection. We welcome your thoughts and reviews below.